Why yes, that gigantic whole wheat challah was turned into bread pudding. 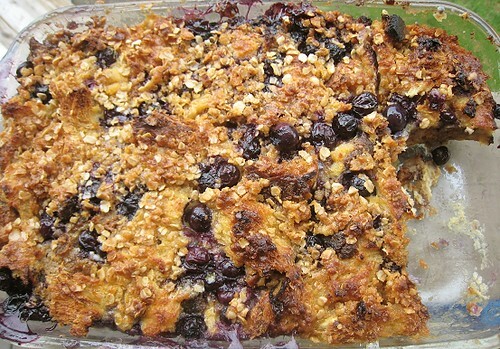 I turned to Bittman once again for a base bread pudding recipe. Of course, I didn't really know how much "8 slices of white bread" are in comparison to our humongous challah. So, I simply winged it in terms of increasing the quantities of ingredients. I also added some things and changed some things around. First, I followed the recipe and heated some milk with butter, sugar and salt. I decided to add some cardamom pods to the milk. Why not? I poured the warm cardamom-infused milk onto my torn pieces of challah. I let that sit for a minute or so while I beat some eggs. Then I poured the eggs over and mixed it all up. 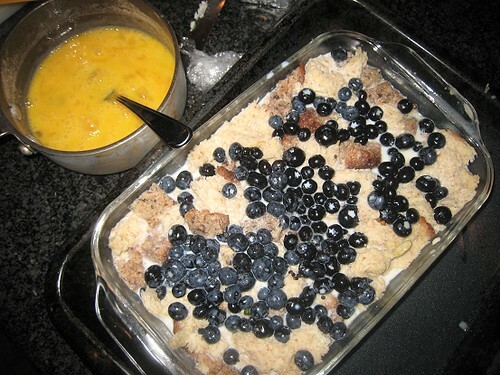 We happened to have blueberries on hand, so of course those went into the bread pudding. Instead of just sprinkling sugar on top, I made a crisp/crumble topping with butter, flour, oats and brown sugar. I didn't bother with the bain marie (or maybe I just forgot or didn't read the recipe carefully), so straight into the oven the bread pudding went. Then it was just a waiting game. The yield: a lot; that being one 13 x 9 pan. I think this bread pudding may have made me like bread puddings! Of course, the blueberries played a large role in this. Blueberry crisps are one kind of dessert that we have actually made more than a handful of times, and they're always hugely popular. Who can resist that crisp topping! But, I think that perhaps this bread pudding wasn't as "custardy" or "eggy" (or wobbly) as others I've tasted in the past. Of course, this is no doubt the result of my "winging it" proportions of ingredients. This version of bread pudding was more dense. I like this texture more. Ice cream or gelato would've been perfect, but we didn't have on hand. We somehow had some mascarpone cheese, so that had to do. Not that we had any complaints. The ingredients list is from the book, but the method has been paraphrased. Warm milk, butter, cinnamon, 1/2 cup sugar and salt until the butter melts. Butter/grease an 8-inch square baking dish. Cut/tear the bread in bite-sizes pieces and add to baking dish. Pour milk mixture over the bread. Let sit for a few minutes. Beat eggs and pour into the bread mixture, swirling to get the egg incorporated all throughout. Mix remaining sugar and cinnamon and sprinkle over top. Place baking dish in a bain marie. Bake for 45 minutes to 1 hr, until a knife through the center comes out clean. The center will be slightly wobbly. If you wish to brown the top, place dish under the broiler for a few seconds. 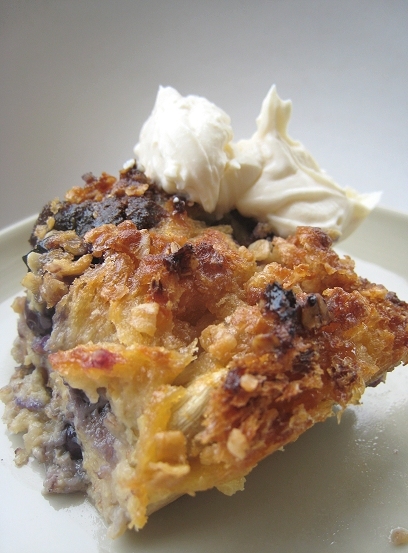 Bread pudding was one of my quick desserts to make when I was in college. But yet to make with blueberries....Nice! 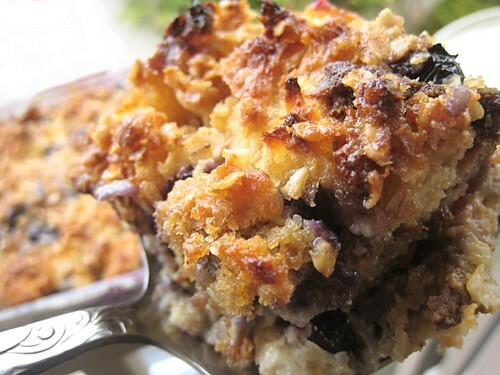 Looks fantastic :) I've always been a bread pudding fan, though! I made this almost exact dish with melon this summer. Looks delish. 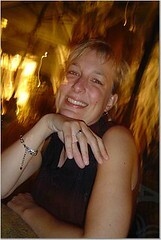 and what is going on with your pictures--they just keep getting better, and they were excellent to start with. If I am a die-hard challah fan, I'm an even BIGGER fan of bread pudding. So, I am loving this idea. And the photos... that dreamy cloud of marscapone almost put me under my desk! OMG this looks so amazing. I am such a blueberry nut and challah...well I just love it! I love challah french toast. And I love blueberry pancakes. But your bread pudding tops them all off. NEED to make this one. Ooh jeez. The mascarpone is where it goes over the top! I love bread pudding (and strata, and anything else that is custardy and bready) and cardamom is one of my favourite spices. HEAVENLY!! This looks awesome. I wish blueberries weren't so expensive right now. Oh my gosh, that looks absolutely delicious. And with mascarpone? I think I just drooled on my keyboard. Oh my, I love bread pudding. I have tried a making it a few times but I was never happy with the results - either too soggy or too dry. Yours looks great! 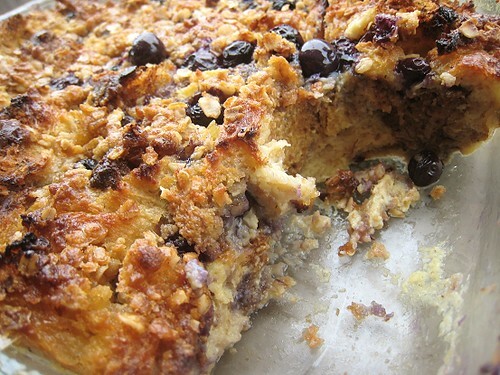 gooey deliciousness, made even better with blueberries. frankly, this is probably the best bread pudding i've ever seen. 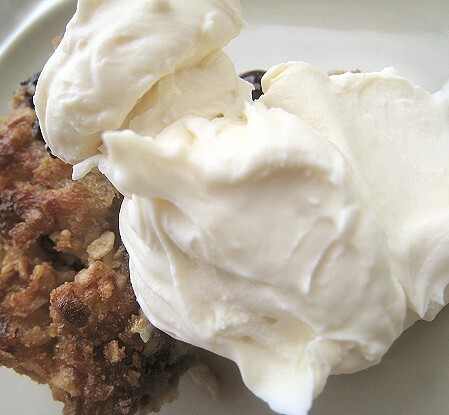 Oh, how could you not like bread puddings? That is my favorite dessert of all time. This one with the addition of cardamom sounds lovely. Oh that looks incredible... I like my bread puddings less custardy, but heavy on the butter so the bread on top forms a crispy crust. Love the idea of a crsip topping! I think we like anything with blueberries! Yeah, and in his current recipe, they are mixed together. Just trying to make my life difficult, that Bittman. 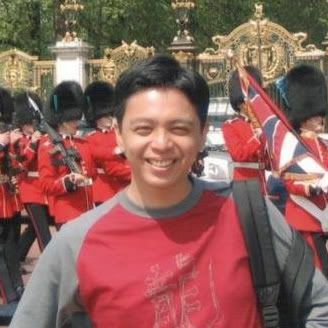 Teehee, I almost didn't put that mascaropone shot in the post because I thought it really was just a gratuitous photo! We can't be responsible for any computer equipment damaged while viewing this post. Ah, a "specialty" cream you want us to have. ;P I've seen it around SOMETIMES... but it seems so expensive! Yes, I think I've just realized that I don't like bread puddings that are too custardy.